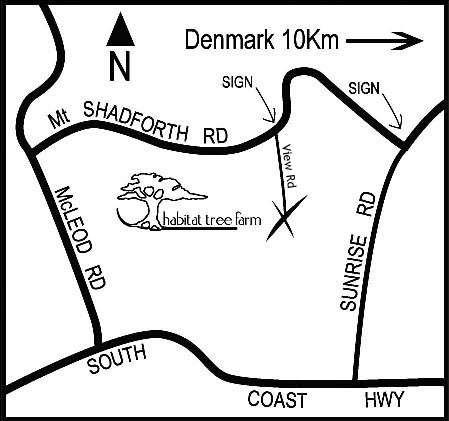 Habitat Tree Farm is located on the south coast of Western Australia 11 km West of Denmark on scenic Mt. Shadforth Rd. In Denmark turn into Mt. Shadforth Rd at Dewson’s supermarket and follow Mt. Shadforth Rd for 11 km. The driveway to our nursery is to the left and well signposted. We are open Monday to Saturday from 10 am to 5 pm, or you can ring us to arrange a time.